In light of the recent developments in our understanding of JFK's foreign policy vision, Jim DiEugenio writes: "In sum, this is not a bad book. And I think some of its faults can be explained by Shaw’s association with the Wall Street Journal and the Hoover Institute. But in my opinion it could have been much better". What could have been an important and sterling volume is seriously compromised with a lot of litter. Instead of being up there with Rakove and Muehlenbeck, it stands a couple of steps downward, with Thurston Clarke’s mixed bag of nuts, concludes Jim DiEugenio. 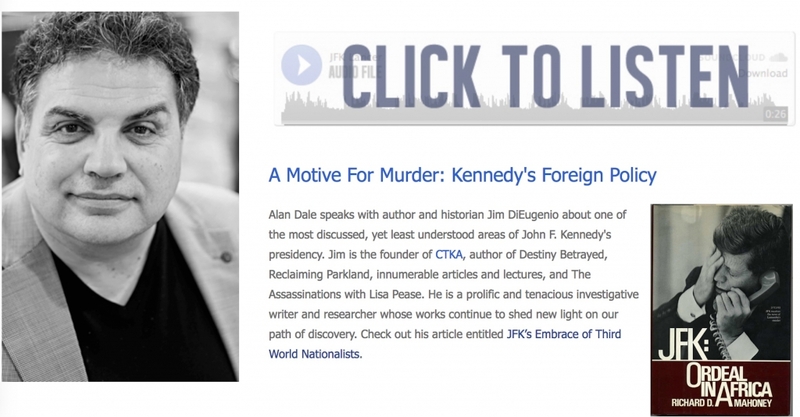 "A Motive For Murder: Kennedy's Foreign Policy" – audio interview with Alan Dale, at JFK Lancer. This film is much worth seeing. And it deserved a much larger platform than it got last year. Right now, it's the best screen depiction of Kennedy's foreign policy that I know of, writes Jim DiEugenio. A valuable Big Picture book, one with many new sources for study, which bring in much fascinating information. The light [Swanson] sheds on men like Nitze and Acheson show just what hollow clowns the so-called Wise Men of the media really were. [The book] also demonstrates just how powerful and dangerous the Military Industrial Complex has become. By showing Kennedy's opposition to it, he may have also shown why Kennedy was killed, concludes Jim DiEugenio. The once progressive co-author of A Populist Manifesto with this book has written the worst kind of alternative history, one seriously colored by the view from the present, and more specifically, of those who won and those who lost, with a decided bias in favor of those who won, writes Jim DiEugenio.